The Hive Bar has now been open for over a year. Through our service and environment we aim to become synonymous with exceptional standards and high quality beverages. Main Duties & Responsibilities As a Bartender, you will be expected to provide a prompt and professional service to customers. You will be expected to comply with licensing laws, health and safety legislation anddepartmental policies. Other duties include being fully conversant in the preparation and serving of cocktails and drinks to The Hiveâ€™s standards, maintenance of stock, processing of payments and maintaining a clean environment for customers and staff. 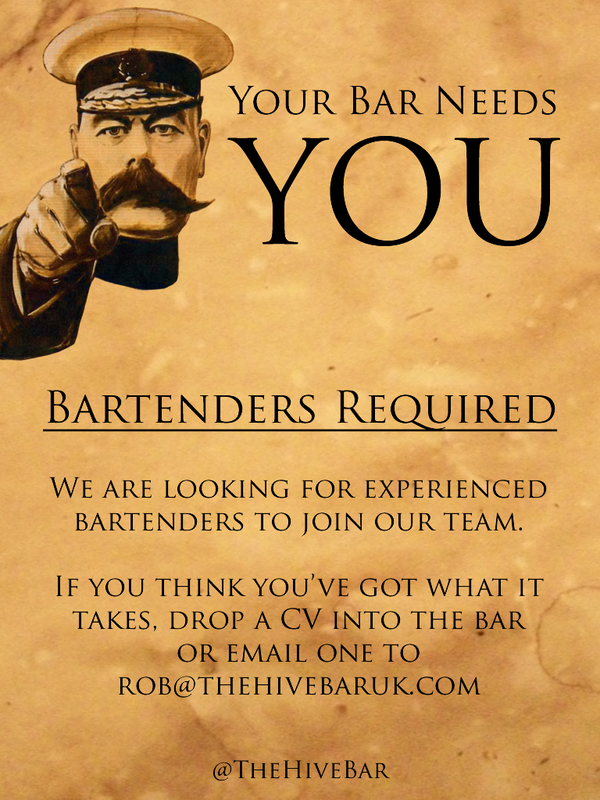 Entry Requirements We are looking for a Bartender who has exceptional customer care skills, who enjoys working as part of a team and has the ability work under pressure. The ideal candidate will be enthusiastic, highly motivated, has exceptional attention to detail and strives for service perfection at all times. Experience is preferable but not essential.